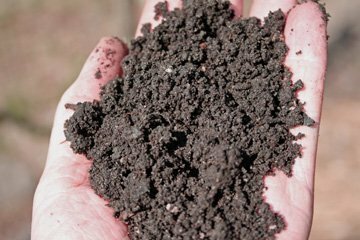 Building healthy garden soils can seem daunting to a new gardener since soils and sites are so different. Basically, you want to feed the soil, not the plants. Here are some guidelines for feeding that hungry garden soil to make your plants thrive. Soil needs to breathe. Remember this when you are piling on six inches of mulch. What we are really trying to do is create a biologically active soil, teaming with microorganisms that break down organic matter and feed our plants. These microorganisms need oxygen to live and reproduce. So if your soil is covered in a thick blanket of mulch, or saturated with water, or a hard-packed clay, there is no available air and little life. We dig and loosen soils to create air spaces that stimulate life. Soil needs organic matter. Again, we want to support active microbial life that feeds on organic matter. As organisms decompose the organic matter, it not only provides food for the plants, it also creates the “glue” that holds soil particles together in tiny clumps. This makes the soil softer and easier to penetrate by roots, worms, air and water. We call this the structure of the soil. With good soil structure, your garden needs minimal tillage and both holds soil moisture and drains well. So what kind of organic matter do we add to our soil? There are many options here, but a key point to remember is that organic materials can be raw (think kitchen food waste, freshly fallen leaves, or even sawdust—none have decomposed at all), partially decomposed (manure) or fully decomposed (fine, brown, odor free compost). However, if you mix raw organic materials into your soil, the microbial organisms will work on decomposing it, but that process can be very slow and can tie up available nutrients to the plants. If you mix in partially or fully decomposed materials, the microbial organisms can begin making nutrients available to plants immediately. This is the main reason we want to add composts to our garden. Compost quality depends on what went into it. Buying compost in bags or bulk is handy, but if you are applying more than a bag or two, you can consider testing it first to make sure it’s not bringing in residual herbicides, weed seeds (watch out for this with horse manure), or excessive nutrients that can burn plants. A simple test involves mixing up several small pots of compost and sterile potting soil and planting bean or pea seeds. If the second set of leaves emerges normally, not distorted, and you don’t see weed seeds germinating, you can assume it’s of good quality. You can make your own compost in all kinds of ways, the simplest being with food scraps from your kitchen and leaves. Start with a layer of leaves, throw on your food compost, add a couple handfuls of soil (remember we want those microorganisms) and finish with a layer of leaves. Keep layering like this until you have a pile at least 4-6 feet high and 3-5 feet wide. At that point, leave that pile alone to decompose, and start a new one. For a neater look, cut a 10-12 foot length of 4-foot high welded wire fence, form it in a circle, and you have an instant compost bin. Or you can get fancy and build a wooden bin. By any method, if you turn the piles, they will decompose quicker because those microbes love the oxygen. Leaving them alone will still give you a good product, just not nearly as fast. No mention of soil testing yet, because you add your compost materials first and then soil test. Compost can have a high pH and nutrient content, so to get an accurate analysis, you take your samples after you have the compost in place. The North Carolina Department of Agriculture and Consumer Services offers soil testing for homeowners (ncagr.gov/agronomi/sthome.htm). Follow lime and fertilizer recommendations, and you are ready to plant. 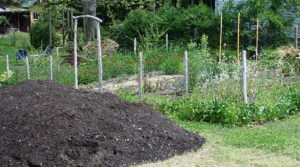 Refresh your garden’s organic matter each year with an inch of compost and a 1-2 inch layer of mulch and you will have well fed soil and healthy plants.